Only missing Amy, Karen and Sherrinda in this pic! I’ve been REALLY looking forward to this weekend! 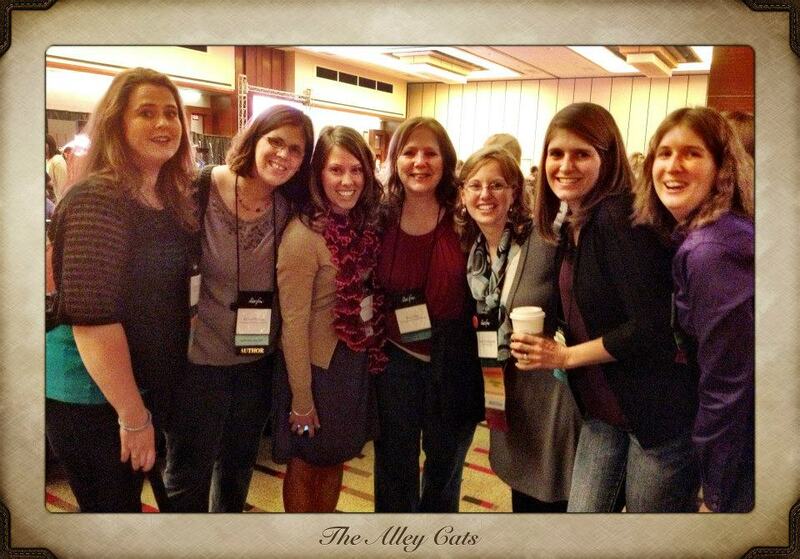 I blog with 9 other women at www.thewritersalleys.blogspot.com … we nickname ourselves The Alley Cats:-) It’s all about writing and we’re all writers at various stages of our writing journey. I got the privilege to meet most of them in September at the ACFW conference. AMAZING experience to say the least! We were all sad to see the end of the conference come, and dreamed up the idea of having our own “mini-writing-retreat” so we could have some quality time just the 10 of us. Well, 3 of our feline crew weren’t able to make it (one of them because she lives in Australia… a bit of a commute!) BUT!!!! This weekend the 7 of us plus the other 3 via Skype are converging in the Des Moines area in IA for a fantastic writing weekend filled with laughed, fun, writing, and worship. When we got together in September… something just… clicked. I don’t know if I can explain it well, but each of us are very different and unique. We have different denominational backgrounds, different styles of worship, different personalities, and our age range varies by several decades! This is not a “usual” group… but somehow we just mesh together like this fantastic little mold that Jesus made, just for us! We all understand and accept our differences, even celebrate them, and I can honestly say in the 3 years we’ve been together, I don’t recall even one time where a harsh word has been spoken or a feeling has been hurt. We just all work on loving on each other and encouraging each other… and it WORKS! So needless to say, I’m over the moon to get together with my sweet writer friends. This Momma could use a wee bit of a break! That I make it there in one piece! I’m driving our not-quite-stellar car to St. Louis, and then meeting up with a fellow alleycat and driving the rest of the way in her car. BUT… I’m leaving at like 3 in the morning tomorrow, so please pray I make it there AWAKE and that my car behaves!!! That GOD will be glorified through our time together… that we can encourage each other and that it will be the much needed fellowship time we all crave! For my hubby who has taken some vacation time (and worked alot of extra hours this week!) so he can take off the whole weekend to watch kiddos… he has TWO softball games to take Lacy to this weekend… by himself with all 4 kiddos. Yes, please pray for him!!! For sweet Annabelle… she has a pretty good sized cold so I’m more than a little nervous about leaving her… but I’m trying to remind myself that colds are NORMAL and that I need to not freak out over normal stuff!! But please pray that she is able to get over it!! She seemed a LITTLE better this morning… but just a little. Hoping it is be beginning of her feeling MUCH better though! There are SO many kiddos at Vanderbilt right now that I’m praying for!!! Please keep them in your prayers… specifically for sweet Gracie who is waiting on a heart like Annabelle did two years ago! For sweet big-boy David’s family… David, who just turned 4, went to be with Jesus yesterday around 12:00 in the afternoon. Please pray for peace and comfort for his family, including his mom Jennifer and dad Justin, and his sister. Discussion: Have you ever been on a fun road trip??? I LOVE road trips 🙂 We are a family of 6: 4 kids just like you. Only our oldest is a boy. BUT, we started road tripping while in college heading home for breaks, then when we got married, we drove from Cincinnati to Savannah, GA for our honeymoon. We took our first serious road trip with our kids 2 years ago to DC. Then last year again to SC, and this year we are heading to Florida for my first time ever 🙂 12 hours and so excited! Kids can be difficult in the car (especially the 14 month old we will have this year who was 6 weeks old last year and slept most of the way) but one of the things I look forward to the most is the drive 🙂 Lots of talking time with my kids and hubby. Hope you have a great and safe trip! Enjoy every minute of your road trip … find the joy in each moment. Delighted to meet you today. I hope you don't mind if I splash around a bit to get to know you. This looks like a refreshing place to dip into some goodness.